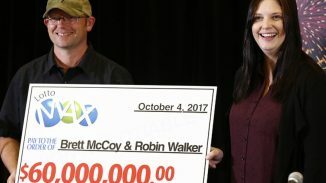 Powered by LottoTech, LottoPalace is an online lottery website, which is one of the 5 online gaming sites being operated by Altair Entertainment N.V and Payific LTD. The website is regulated by the government of Curacao and is available in two languages; English and German. The wide variety of lotteries it has to offer has contributed to the website’s popularity. Not only does LottoPalace offer you more than 10 single play games, it also provides you access to instant win games, scratch cards and syndicates. There are also bundles that you can take advantage of and they don’t take commission, which again works in the favor of players. Getting started at LottoPalace is quite easy because the registration process doesn’t take you more than 5 minutes. The website also gives you the option of signing up through your Facebook credentials, which makes the procedure even quicker. However, players should bear in mind that if online lotteries are not permitted in your country like the US, you will not be able to create an account on LottoPalace. But, if you do have permission, the website can provide you access to an excellent mix of games that hail from a plethora of countries. There are approximately 13 games that you can enjoy, which include some really notable ones. 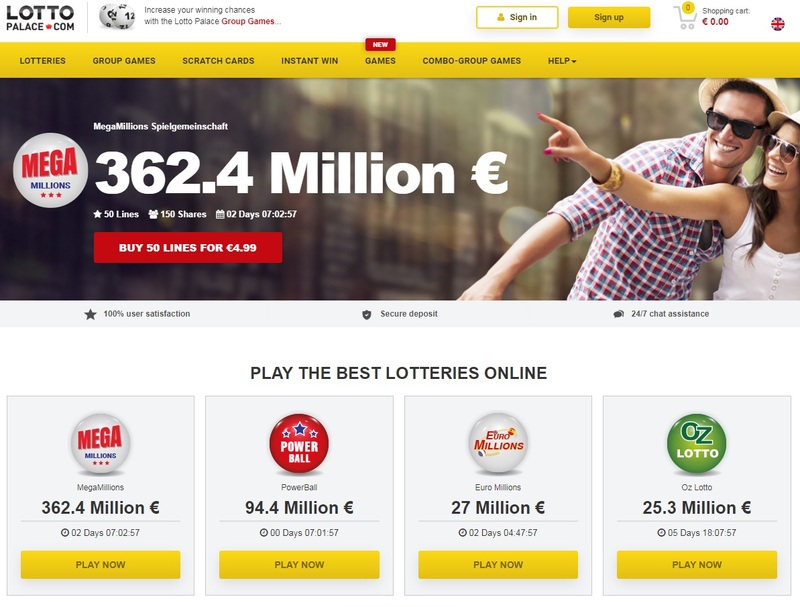 You can play US games such as Mega Millions and Powerball, Australian lotteries like the OZ Lotto and Australian Powerball as well as European lotteries such as the UK Lotto, EuroJackpot and Euromillion. The other games that you can find are Austria Lotto, Sweden Lotto 1, Irish Lottery, Bono Lotto, El Gordo de la Primitiva and Lotto6aus49. An important thing that should be noted about LottoPalace is that it has kept the ticket prices very reasonable and gives good deals to players who wish to participate in international lotteries. One of the best things about LottoPalace is that unlike many other websites, it doesn’t skimp out on the syndicates. Currently, the website has nearly 12 syndicates to offer to its players, which is considered amazing because these syndicates improve your chances of winning. The syndicates you can find at LottoPalace comprise of almost all the lotteries that are available in their single play section. But, there is one that is only exclusive to group play and that is Lotto France. Other than that, they also offer syndicate bundles to make things more exciting for the players. There are 11 virtual scratch cards that you can find at LottoPalace. The good thing about these games is that they are not like the usual ones that other lottery websites have to offer, but they are based on the same concept. They also have quite reasonable prices and the prizes are also impressive, which makes them a really good addition. For those who don’t like the virtual scratch cards, the website also provides 8 instant win games. These games are very similar to video games, which means they are more interactive than scratch cards. However, the most appealing element of these instant win games is that they can offer bigger prizes. LottoPalace has also proven that it values their clients’ trust because they are using the maximum level of encryption for transactions and data security i.e. SSL 256-bit encryption. This means that players can use the website without worrying about the safety of their personal details. Furthermore, LottoPalace is also regulated by the laws of the Curacao EGaming Commission and they follow their standards. They are subjected to procedure checking and deep investigation on a regular basis. It is also noted by Google Safe Browsing that the website is free of any unsafe content. The overall interface of the website is another factor that adds to its appeal. The website design is quite simple and nothing complicated for even first-time users. You will not be irritated by any obtrusive ads and LottoPalace has also provided a couple of samples of the games available right on the homepage. Not only do they provide quick and easy access to the games, but they also make it incredibly easy for the players to get a good sense of what the website can provide instead of having to go through their entire selection. Moving onto the payment and withdrawal options, you have four options when you are interested in depositing money. You can use your Visa or MasterCard or either use Giropay and SoFort for this purpose. But, in the case of withdrawal, there is only one option that is bank transfer and players may have to submit their ID and other documents before a withdrawal is granted. Also, the website has stated that the withdrawal can take up to five days or more. LottoPalace also has a customer support section aimed at assisting its customers in the best possible way. To begin with, you can find a FAQs section that answers any common questions you may have about the website. But, if you don’t your answers there, you can make use of some of the other alternatives to reach out to LottoPalace. You can get in touch with them through email or you can also go with the option of Live Support to get your answers. Phone support is not yet offered at the website. The live chat option provides assistance in English and that’s a major benefit. You can visit the LottoPalace website from your desktop PC, smartphone or tablet without missing out on user experience or any functionality for that matter. It doesn’t matter if you own an Android, iOS or even Windows smartphone as LottoPalace has been designed to have a responsive theme that will work on any device. This responsiveness means that every single element of the website will adapt itself to the screen size being used. As far as promotions are concerned, currently, the website is not offering any. Nevertheless, playing online scratch cards makes you eligible for a discount, depending on how many you buy. The design, responsiveness, user experience and offerings make LottoPalace an excellent platform for indulging in your love of the lottery.